There’s a need to plan for the mobilization of Civil Air Patrol resources to meet the potential demands of a national emergency. It seems that there are about as many conceptions within Civil Air Patrol (CAP) about how to mobilize its resources as there are members. The final result is clear without a national CAP mobilization framework, CAP’s command and control structure would be fragmented. With no central direction, its support of military services, commands and federal agencies and their war plans would be uncertain. For many years, the Civil Air Patrol has desired and actively sought a wartime mission from the federal government. Since the 1960’s, Civil Air Patrol’s responsibilities in a national emergency have been described by a set of various agreements between individual CAP wings and their states. State-level agreements were called for due to an absence of interest at the federal level. In 1983, though, the Civil Air Patrol’s Southwest Region participated in an exercise called “First Time.” CAP was brought back “into the fold”-referring, of course, to CAP’s exercise play as a federal participant in national emergency operations. Among the players in exercise “First Time” were the Federal Emergency Management Agency, the Department of the Air Force, and the U.S. Readiness Command. Each of these agencies has a vital defense responsibility, and each has expressed a desire to work closely with Civil Air Patrol in emergency planning. Now the corporation must reconcile its earlier (1960’s) position of support to the States with the more recent trend of support to the federal government. Under the new concept, support to state and local governments would be provided only on a noninterference basis to federal tasks. We must make a concerted effort at the Civil Air Patrol National Headquarters to match the superb planning efforts of the Disaster Preparedness Division at CAP-USAF with operations and planning guidance for all levels of the Civil Air Patrol. The guidance would serve to clear the confusion that many within our organization have about our emergency functions. It is to this end that this report is written: to convince top-level Civil Air Patrol decision makers that certain actions are needed to prepare CAP for its role in national security preparedness programs. International conflict takes many forms and requires many responses. The period since World War II has been characterized by international conflicts of varying intensities. The major powers have carefully controlled the scope of their activities, however, to avoid the risk of general war. Such conflicts are likely to continue. So, too, is the exercise of restraint. Relatively small-scale wars and insurgencies would probably require some degree of American involvement-political, economic, or military. U.S. forces might be committed to action in one or more areas of the world, but the scale of U.S. involvement wouldn’t require significantly expanded civil response to support its military action or maintain assistance to its allies. The conditions described here could change into a condition of limited war involving the use of sizable American forces on foreign soil. Or, a limited war would begin without evolving from a small-scale conflict. In such limited war, American forces might have to be used in several areas of the world at the same time. Simultaneously, the U.S. might still have to fulfill other requirements for foreign assistance, counterinsurgency, and counter-terrorism action. These activities, singly or in combination, could require extensive mobilization measures in this country. The calculated initiation of general war by any present nuclear power is considered unlikely. Nevertheless, as long as the world’s nuclear war making capability exists and spreads, there is a possibility that general war could occur. There are many ways it could happen, including accident, miscalculation, an irrational act, or the unplanned escalation of limited war, as well as by a deliberate attack. A nuclear attack or its threat would require the swift use of comprehensive emergency measures to mobilize the Nation’s resources, not only for the defeat of the enemy, but also for the survival and eventual recovery of the United States. The elements of total involvement of all the people, institutions, and resources of the Nation, with their complicated interrelationships, make this the most difficult contingency for which to plan. National emergency preparedness is a multidisciplinary field involving all three branches of the federal government and the entire U.S. industrial base. Emergency preparedness is nothing new to the federal government; mobilization readiness has been a shared responsibility of the Federal Emergency Management Agency, the Department of Defense, and other federal departments and agencies for many years. The United States Government has a policy of total national involvement, that is, the emergency preparedness of the Nation is a program of such magnitude as to involve all citizens and governments at all levels. Additionally, if the U.S. were attacked or threatened with attack, the federal government would exercise sweeping direction and control in the interest of national survival. 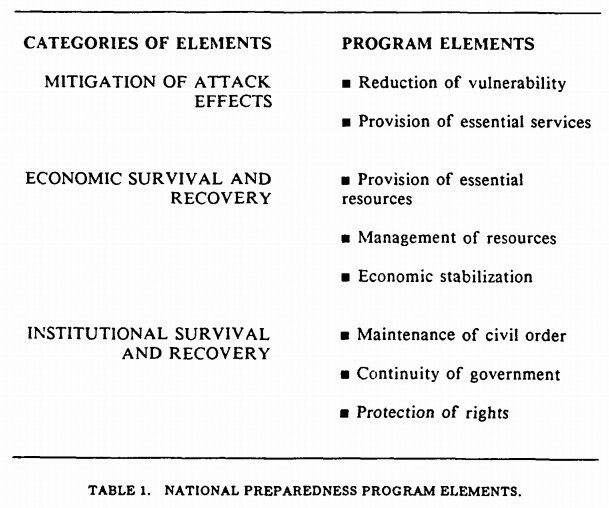 Table 1 briefly, shows the elements which make up the overall national preparedness program. Most elements have pre-attack and post-attack objectives. Some, however, are chiefly geared to a post-attack circumstance, e.g., economic stabilization and continuity of government. In addition to the primary program elements, emergency preparedness programs include some support functions. Communications provide reliable connections among levels of government and the people. Assessment of attack effects, including the collection of weapon detonations and effects data, allows government personnel and the general public to make rational decisions. Education and training in the pre-attack and mobilization time frames is essential to the national preparedness effort. Tests and exercises assure that plans can be successfully translated to actions in an actual crisis. Though the responsibility for national planning lies at the federal level, every state and local government has a responsibility to protect its citizens and serve their needs. Together, all levels of government, the private sector, and individual citizens form together to ensure national survival. In 1946, the Congress incorporated the Civil Air Patrol and stated that one of its purposes should be to “encourage and develop by example the voluntary contribution of private citizens to the public welfare.” Ever since its creation, the Civil Air Patrol has been willing to accept the call to duty in a national defense role. The reasoning for the Commander’s decision is probably best explained by comments in a letter from CAP-USAF to the Continental Air Command.8 Here, they explain that CAP wings should not directly support Air Force Survival, Recovery, and Reconstitution plans because this would conflict with written agreements with individual states. CAP-USAF’s concept was that CAP would “respond [directly] to the State Director of Civil Defense,” which essentially gave absolute primacy to states’ requests in national emergencies. Between the mid-50’s and the 70’s, individual CAP wings signed agreements with state and, sometimes, local officials. These agreements detailed CAP’s support to the Civil Defense structure in the states in times of local disaster and national emergency. The only federal operations envisioned would have been performed under the auspices of the State and Regional Disaster Airlift Plan. By piggybacking federal tasks with state operations, the connection between CAP and the federal government became less distinct. Though the idea of Civil Air Patrol’s responsibilities in a national emergency lay dormant for a while, they were rekindled in about 1977. The Deputy Chief of Staff for Operations at CAP-USAF began to explore CAP’s capabilities in crisis and national emergency periods. They laid out the general groundwork for future operations planning, including tentative assumptions and goals. Since then, we’ve made major strides towards a closer CAP-federal government relationship in operations planning. Specific references to Civil Air Patrol in plans like the USAF CARDA Plan and in various Air Force Survival, Recovery, and Reconstitution plans are recent developments. Plans don’t mean anything if they can’t be converted to action. Military exercises provide a means of testing plans and actions before an actual emergency. In 1983, several federal agencies invited the Civil Air Patrol to participate in their military readiness exercise as a preliminary test of the CAP-federal interface. The exercise was a success; several agencies’ representatives saw, first hand, that the Civil Air Patrol is a national asset that they should use. Civil Air Patrol is capable of supporting several different agencies during and after domestic and national security emergencies. Our ability to provide transportation, communications, and manpower which don’t move to foreign theaters of combat is unique. It’s for this reason that we should continue to express the primacy of federal tasks over others. Unfortunately, most, if not all, Wings have the comprehensive agreements with their states which we outlined on the first page of this report. These agreements most surely are set on a collision course with the expanded numbers of federal tasks being assigned to CAP. Even though the agreements should have a caveat regarding federal versus state taskings, the states involved may feel cheated. Moreover, many persons within Civil Air Patrol have different (and often conflicting) notions about how the CAP operates, and from whom it receives its “orders,” in a national emergency. Although the CAP-USAF Deputy Chief of Staff for Operations is drafting a second emergency operations plan, policies regarding how CAP operates and how its organizational structure is altered during crisis or national emergency should be overseen by the National Executive Committee. We need to study the effects of the switch from state to federal operations more closely. How can we benefit the Air Force, the DOD, and the federal community in the greatest way? How can we integrate our commitments to federal agencies into an overall exercise program to ensure our readiness? In what way can we best integrate the planning efforts of CAP-USAF into corporate policy? These tough questions await us. Our two chief recommendations are described in the following section. The first suggests the formation of a working group or committee to study these problems in-depth and to report its findings to the National Commander. The second, equally important, recommendation suggests the development of planning and exercise guidance. Each of these programs addresses critical shortfalls in Civil Air Patrol’s wartime operations preparedness. We recommend the National Executive Committee create a working group or committee called the National Emergency Preparedness Committee. The committee would be composed of a chairman, a vice-chairman, and eight regional representatives. The committee’s charter would be to coordinate with the CAP-USAF DCS/Operations, other national committees, and the NEC regarding emergency preparedness matters. 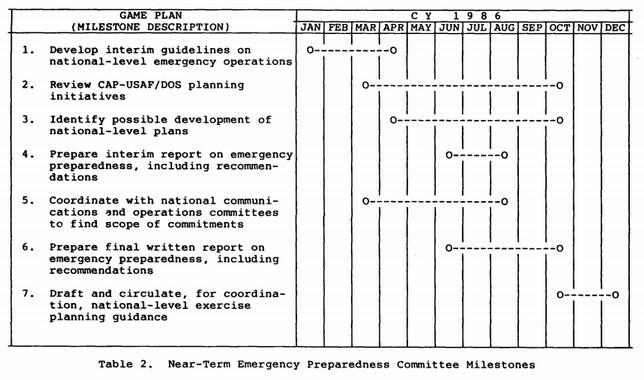 The committee would investigate ways to ensure the continuous function of the Civil Air Patrol during domestic and national security emergencies, to support the federal government in periods of international crisis, to plan for a viable CAP mobilization framework, and to suggest emergency resource management guidance. In addition, the committee would report its findings and recommendations to the National Commander, including, on an annual basis, a report of CAP’s state of emergency preparedness. A suggested set of near-term milestones is shown in Table 2. We recommend the National Executive Committee direct that the proposed National Emergency Preparedness Committee prepare and coordinate guidelines on operations plan preparation and on exercise design techniques. Standardization in these two areas will have a significant impact on the quality of plans, and the consistency of emergency preparedness throughout the entire CAP organization. Operations plans provide the set of instructions to our membership during major emergencies. Since no field guidelines exist today, most of the planning is done ad hoc, without the benefit of review or coordination-the two most critical parts of up-to-date plans. National guidance would simplify and standardize the process by giving planners sample plans and planning checklists. Be the first to comment on "Why Civil Air Patrol’s Emergency Preparedness Planning is Not Effective"
Greenberg also had outstanding warrants out of New York, where he served with the CAP organization in 2012 and 2013, according to AuxBeacon News. According to a search warrant issued in Cabarrus County in January, Greenberg was charged with 19 counts of sexual abuse against juveniles out of Suffolk County, New York, in February 2016.